Kyoko Okitegami (Yui Aragaki) is a private detective. She is known as the Forgetful Private Detective. When she wakes up in the morning, her memory is reset. Due to this, she rigidly adheres to a maintenance secret. No matter what case she has, she has to solve the case in a day. On her body, she has an important note that she must never forget. 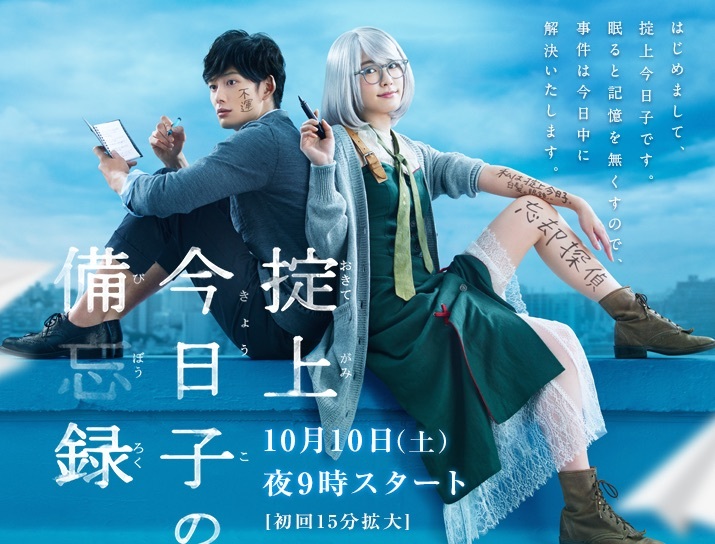 Even though Yakusuke Kakushidate (Masaki Okada) has a crush on Kyoko Okitegami, he is alway mistaken as the culprit of a case by Kyoko Okitegami. No matter how close Yakusuke Kakushidate gets to Kyoko Okitegami, she totally forgets about him by the next day. Based on novel "Okitegami Kyoko no Biboroku" by Isin Nisio (published October 14, 2014 by Kodansha Box). Nope Jun 20 2018 9:48 am Ss2 onegaiiiiiiiii!!!!!!!!! JmFeels Feb 03 2018 1:50 pm Season 2 Onegaiiiiiiiiii!!!!!! Airi Dec 25 2017 11:40 pm Masaki and Gakky are soooo cute together T_T <3 season 2 onegaishimasu!! celt Aug 25 2017 6:39 pm The drama is light and heartwarming. Gakky and Masaki have great chemistry! Hope they'll have a chance to work again. Reya Aug 21 2016 1:24 pm Absolutely loved this series. For me, it had a weak start, but as I continued watching it just got better and better, leading up to a solid finale (the last three episodes are my favorite). It's a character driven plot led by some amazing leads - Gakky and Okada Masaki are a treat to watch together on screen. They're definitely a pair who have natural chemistry, and I hope they can work together again in future projects. I definitely wouldn't mind a season 2 since there are some questions that have been left unanswered, even though I am quite content on how things ended. An SP would be nice! Heck, I just want more Gakky and Masaki. rubytoro Jun 13 2016 6:15 am I enjoyed each episode, beautiful casts, Okada Masaki was reallly perfect relaying the kind, diligent, sincere, "not lucky" guy here.. (to be loved like that...).There was still a mystery, right? Possibility for season 2? bluelysia May 26 2016 10:35 am this series is really really goooddddd >< it is funny and the way Yakusuke loves Kyoko is really swooning.. I love the ending, but I need a season 2 or SP to wrap up the story even better! Licorice Feb 22 2016 5:14 am The syndrome is similar to the hollywood movie l watched some time ago, played by Nicole Kidman. Kinda awkward to see Gakky with colored hair, but she's still cute! l hope there will be season 2! L SAMA Feb 06 2016 2:03 am this the best japan drama I had ever seen, the storyline is awesome I want the season 2 for this drama I want to know who wrote the statement at kyoko's room ceiling. ravenralph99 Jan 14 2016 10:55 pm I hope there would be a special or movie or season two for okitegami kyoko. It was really good to watch. Aragaki Yui really has been in good dramas for the past decade and hoping that she maybe in a horror or action suspense or fantasy adventure type of role. jaime Jan 01 2016 6:25 am love love love love LOVE the drama!! their chemistry is undeniable and super cute! even though the mystery factor is mediocre, the love line and plot of the drama were subtle yet touching!! this made me love okada and gakki <3 i'm crossing fingers for a sp/movie adaptation. 10 episodes is not enough! cinthy Dec 21 2015 11:19 am I love this show, the actors are great and each episode is very entertaining!! Is ep 10 the end?? Pattana Dec 08 2015 1:31 am I have realized that this drama have been created by the author who created Bakemonogatari series. precious Nov 15 2015 5:59 am omoshiroi jdo... love gakky and masaki kun. yeah they are cute together! gdxxii Oct 15 2015 6:13 am how much episode this drama?? elmode Oct 12 2015 3:16 am good drama for the leads, not too much acting skills required, just good looks and a bit of acting cute. shinya Sep 24 2015 6:16 am The novel was a great read but I don't remember having those 3 additional characters in the first novel though. Licorice Sep 19 2015 8:45 am Damn, it's not aired yet.... T___T The symptom reminds me of a Hollywood movie, played by Nicole Kidman. l hope it will be good! Elmroser Aug 18 2015 6:06 am AAAAAAAAAAAAAAAAAAAAAAAAAAAAAHHH! i totally ship them! there are like my favourite! can't wait! Nanami Aug 18 2015 5:59 am is this like the Isshukan friends? ?